Microgaming is a true innovator and pioneer in software gaming technology. It has developed Beautiful Bones slot for the global online casino market which can be accessed on the net-enabled portable devices. The desktop version can be accessed through an HTML5-enabled browser on PCs or laptops. The theme of the slot is inspired by a Mexican traditional festival called Day of the Dead celebrated on the 1st and the 2nd of November every year. People pray in remembrance of their departed dear ones. We will discuss the main features of this gambling option in this Beautiful Bones slot review. The game format of Beautiful Bones video slots is 5 reels and 3 rows with 243 paylines. Matching symbols from left to right form winning combinations. Bets are placed in coins. A coin size ranges from 0.01 to 0.1. The number of coins that can be bet ranges from 1 to 10. Also, there is a 30x multiplier offered. Multiple bet levels can be set from the minimum bet of 0.30 to the maximum of 30. The game possesses a ‘sugar skull’ meter featuring 3 sets of different numbers of free spins with respective payout multipliers. It also features the ‘spin again’ free spin with a sticky wild. This can pay heavily under certain circumstances. There are 6 playing card characters in the free slot Beautiful Bones. These are 9-A icons with payouts ranging from 15 to 150. The 5 themed human symbols comprise 3 female and 2 male characters. All these have painted their faces to look like skulls in memory of their deceased ones. Their payouts range from 6 to 300 for landing 2 to 5 identical symbols. The 3 female themed symbols may appear in stack on the 2nd, 3rd, and 4th reels only. The wild and scatter symbols are discussed below. The ‘WILD’ labelled red heart is the wild symbol of Beautiful Bones slot machine. It appears when a three consecutive matching symbols combination appears either horizontally or vertically anywhere on the reels. The central symbol of the set gets transformed into the wild. It remains active only in the bonus game. However, 4 or 5 such symbols will not create the wild or activate this feature. A skull on a bed of roses symbolising the contrast of ‘beauty and decay’ is the scatter bonus symbol. The wild cannot substitute for the scatter. It appears on the 1st and the 5th reels only. The free spins bonus rounds is devoid of these scatter symbols. There is a bonus round offering sticky wilds available. The sticky wild is held at its position in this feature during one free spin only. This feature can be re-activated. You can see how it works when enjoying Beautiful Bones free play. Multiple sticky wilds on the reels may lead to multiple wins. Moreover, it may occur during free spins when all the wins will be multiplied by the respective multiplier. As stated above, the sugar skull meter has been used as an important element in the slot. A sugar skull representing a departed soul is used to decorate the gravestone during Day of the Dead celebration. 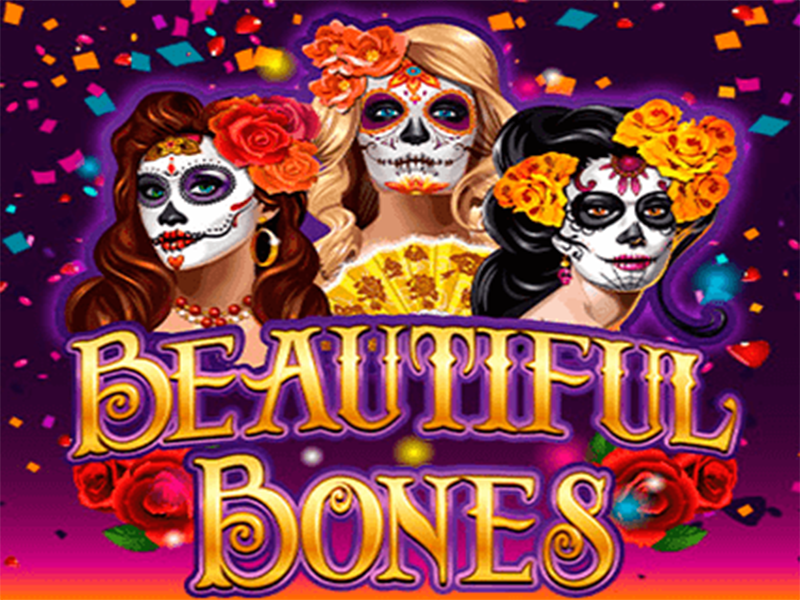 Beautiful bones online slot offers free spins triggered by this symbol. The sugar skull meter takes control over Free Spins Bonus Games awarded according to the number of collected skulls. Each time the scatter skull symbol shows on the 1st or the 5th reels, an award is displayed on the meter. Ten free spins accompanied by a 3× multiplier, 15 free spins with a 4× multiplier, and 18 with a 5× multiplier are the rewards for collecting 10, 20 or 30 sugar skulls respectively. Players are given a choice to claim their free spins award after collecting 10 or 20 skulls. However, the bonus round of free spins will automatically start after collecting 30 skulls. The sugar skull meter is available in ‘Spin Again’ but not in free spins bonus rounds. Hence, free spins feature is not possible to retrigger. The Beautiful Bones slot online has medium variance and a quite high RTP of 96.55%. Mega wins are possible in the bonus games of max free spins with the max multiplier. As players can decide at which level to claim the reward, one possible tip may be to keep stake low to reach that level and set your wager to the max before the last sugar skull is added to activate the reward for the highest payout. 0 responses to "Beautiful Bones Slot"